Here's a picture of the new stone patio Rob and I built a couple of weekends ago to house our old aluminum table-and-chair set. We finished the whole thing in one day. The hardest part of the process was figuring out how to get everything level. Well, at least it looked hard. Rob was the one who did it. Meanwhile, I stood by with a boggled expression. All I can tell you is that a confusing array of stakes and strings was involved and that I kept tripping over the strings. Anyway, I'm pretty proud of how the patio turned out. I think it will look really good once the ferns have filled in around it and it's nestled in greenery. Unfortunately, I can't plant anything else right now since it's so ridiculously dry and hot. Once again I'm doing an hour of panicked watering each day after work. I get home and everything's wilted and I start freaking out. A hydrangea I was inspired to plant after reading One Writer's Garden (about Eudora Welty's garden in Jackson, Mississippi). 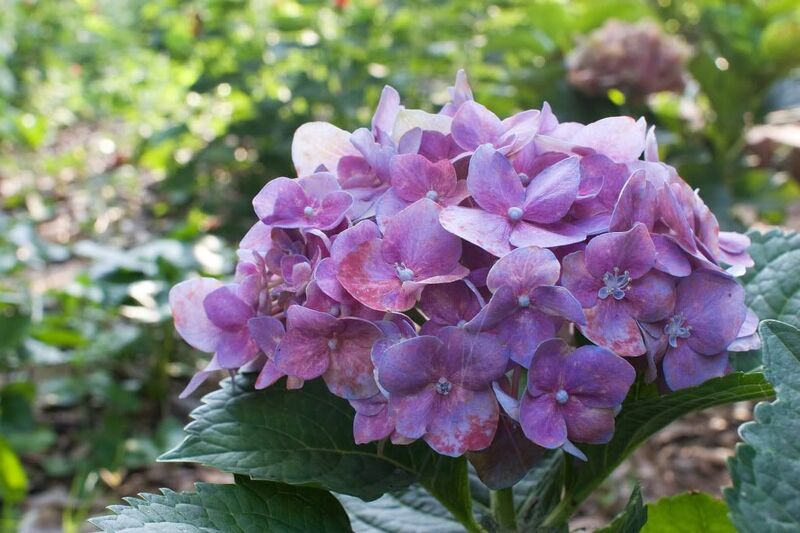 I generally prefer to plant natives, but I do have a sentimental feeling for some of the traditional Southern garden plants--and so I foolishly planted a fussy old hydrangea on a burning hot May day. 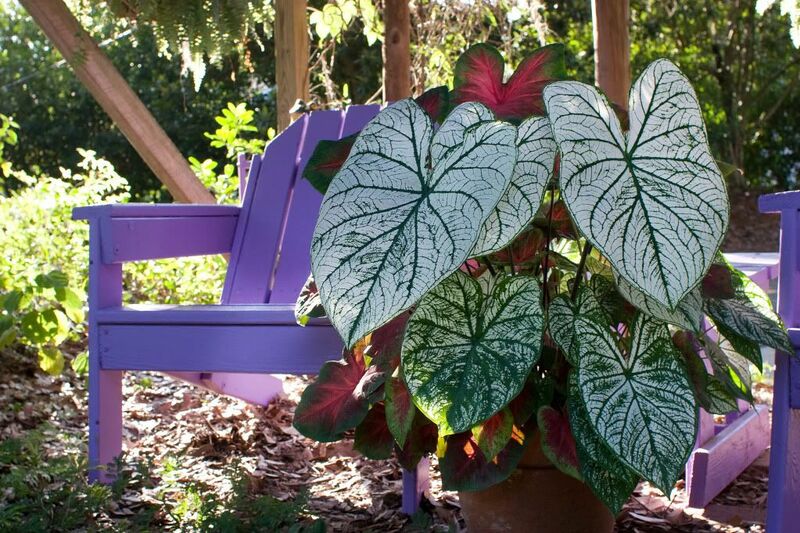 My caladiums again. I'm so proud of them this year. Each leaf looks like a little stained-glass window. The patio looks great! What a beautiful yard you have! Oh, thanks! I love working on my yard. It always gives me something to do. 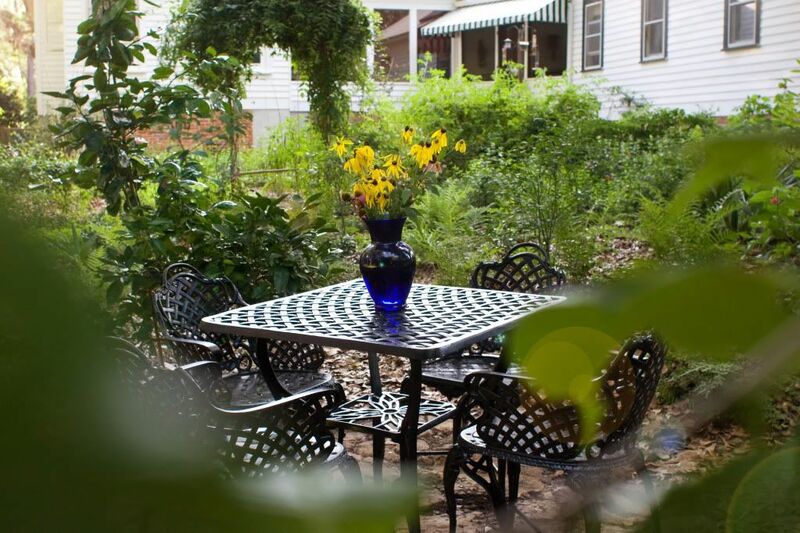 Your patio area looks lovely, and will only get better with time. I think it's neat that you did the project in a day. I love that powderpuff plant, very pretty. I've never seen it before. Is it in annual? Happy gardening and I hope you get some rain to water your gardens. 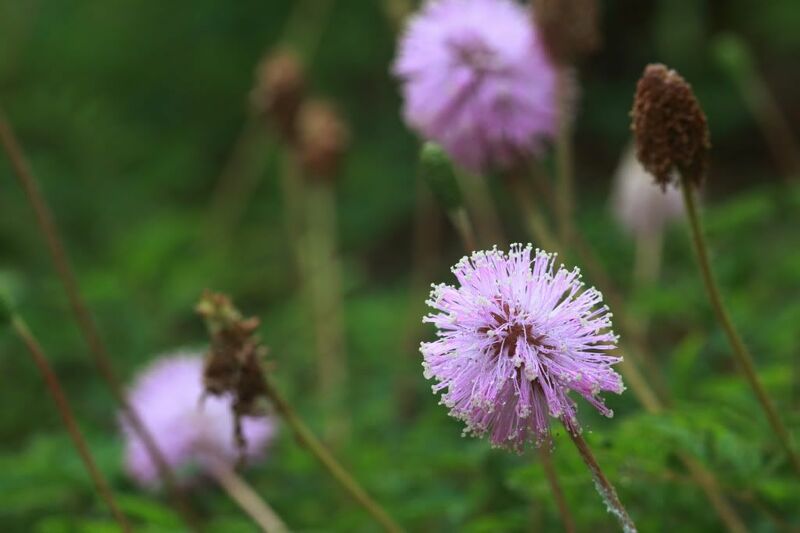 Powderpuff plant is Mimosa strigillosa, a native perennial. It's a great groundcover that spreads like crazy and is wonderfully drought tolerant. Thank you so much for your kind words about the patio! I'll have to take some pictures next spring when the ferns have filled in around it.